Drinking fountains are an important public resource, serving as an alternative to bottled water or sugary drinks and accommodating a wide array of users, including children, commuters, runners, the homeless, and tourists. 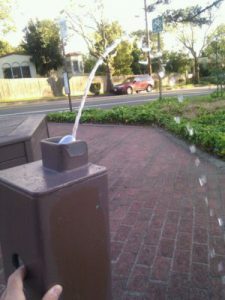 Some fountains are even designed to provide water for pets. A newly released study from the Pacific Institute, entitled “Drinking Fountains and Public Health: Improving National Water Infrastructure to Rebuild Trust and Ensure Access,” discusses the state of the nation’s drinking fountains and addresses concerns about their quality and links to illnesses. The report concludes that the risk of fountain water contamination can be reduced or eliminated altogether through improved maintenance and cleaning or updating and replacing old water infrastructure and pipes. 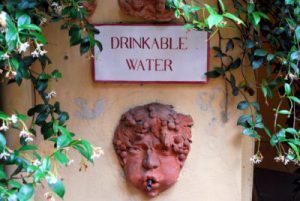 The significance of drinking fountains has been documented since ancient times. Some of the earliest records of public water fountains come from ancient Greek cities, where fountains were both a common sight and a public necessity. A second century Greek writer, Pausanias, wrote that a place can never rightfully be called a “city” without water fountains. Spring-fed public water fountains were typically placed in or near temples and were dedicated to gods, goddesses, nymphs, and heroes. As populations grew and cities expanded, demand for public water systems and new water treatment and delivery technologies led to the increased use of public water fountains. By the early 20th century, public drinking fountains became a fixture of the urban landscape. In the past few decades, however, they have been disappearing from public spaces for several reasons, including the advent of commercial bottled water, decreased public investment in urban infrastructure, concern over the health risks of fountains and municipal water in general, and alaisse-faire attitude toward public water systems. Drinking fountains are essential for maintaining free public access to water, and we need to expand the science and practice of ensuring they remain clean, safe, and accessible. A modest investment by public agencies, school and park districts, and even private businesses could greatly expand the number and quality of drinking water fountains. New fountain designs equipped with filters, chillers, and bottle fillers make fountains an even smarter choice for everyone. Mobile apps that make it easier to find a nearby drinking fountain are currently being tested and could improve access to drinking water, and thus public health. Key recommendations from the Pacific Institute report should be adopted quickly, by federal, state, and local agencies, and by others who build and maintain drinking fountains. These recommendations include consistent cleaning and routine maintenance; installation of new fountains in high-traffic areas; retrofitting or replacement of old models with modern fountains with optional filters, chillers, and bottle fillers; and the elimination of parts and pipes that contain lead and copper. 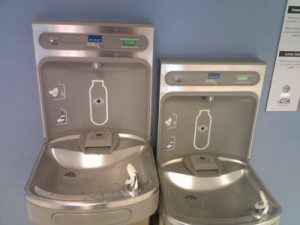 Recent reports of unsafe water from fountains show that the problem is almost never the fountain itself, but old water distribution and plumbing systems that should, with a proper national water infrastructure effort, be upgraded and replaced immediately to remove lead and other sources of contamination. Uniform maintenance guidelines should be developed and widely adopted. These efforts, combined with communications on the results of regular water testing, reports on the performance of fountains, and information on how to find and access high-quality drinking fountains, can help build public trust in water fountains and protect the human right to water.